But my own human form possesses neither the hydrodynamic sleekness of the ningyo nor the poppin' melanin of Mamba Muntu, and my habitat lies among the freshwater seas of the Great Lakes. I could roll myself in glitter fishnets and buy a ticket to the Mermaid MegaFest, which is happening over Memorial Day weekend on the exquisite beaches of Lake Michigan, but I am more of a bog-dwelling shade creature. Big crowds and sunstroke aren't really my thing. So if you do enjoy creative swimwear and frying on hot sand, I would recommend joining the drag merfolk in South Haven next weekend. It looks mega fun for beach bums. If, however, swimsuit season stresses you out, remember that the real merfolk never bothered with it. 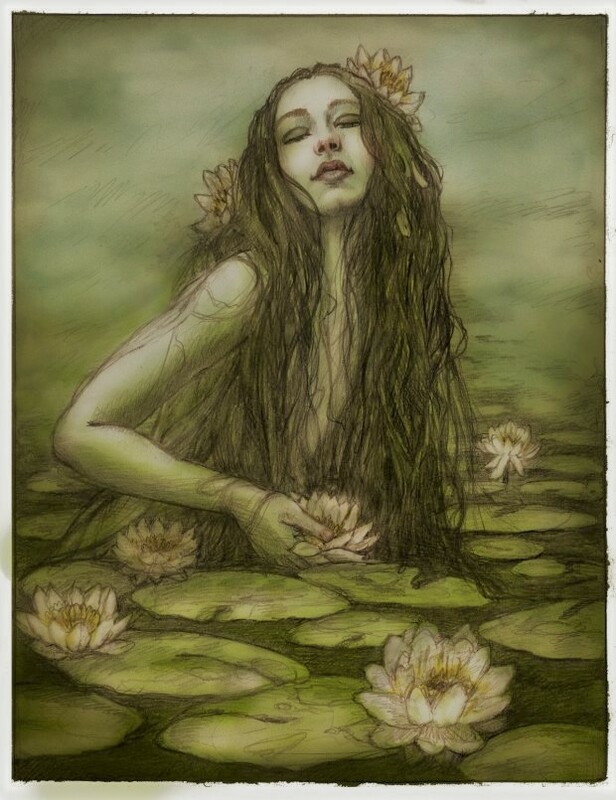 Mythical aquatic seductresses have always been comfortable in their own skin, scales and all, maybe spicing things up with seaweed or lilies now and then. And, like Rihanna's lingerie designs, they rock every body shape and complexion found in human populations. Some are wraithlike and some are buoyant. Some are lily-white, some bronzed, and some deep sea black. Some are young, and some are old. All of them have held power over the hearts of men (and some women) along the shores of every land where humans tread, over millennia. They exist in our collective minds, the same place where feminine beauty standards are made and unmade across time and space. I am nothing like a real mermaid. I can barely swim to save my life, and although I enjoy going to the beach, I have to spend most of my time there on land and out of direct sunlight. I don't go swimming for the purpose of capturing the perfect snap of my hot dog legs; these days, I go to the beach to watch my daughter frolic in her ruffly, neon-colored swimwear. Hair removal: I like to remove a good deal of my body hair in the summer, but I am also appreciating how our culture has relaxed about it à la française. I'll shave what I feel like, when I feel like it, but I'll let my stray hairs and stubble remind me that I am still young and vital and also the boss of my own body. Skin products: Physical sunblock is it for me at the beach. No matter what I do (short of getting professionally spray painted in a thong), I look like the Irish sunbather in the memes; I blend in with white sand and burn easily. My skin is so fair it has bluish undertones. Bronzers and self-tanners make me look like a Trumpkin, and a real tan does violence to my dermis. When I take care of my skin, it protects me from disease, feels nice, and soaks up vitamin D. My natural pallor reminds me that I respect my body and take good care of it. Fitness: I focus on how movement makes me feel more than how it makes me look. Sometimes I do belly dance drills with my eyes closed so I can focus entirely on how my bones and muscles feel. I never, ever attempt weight loss because starving and getting really skinny don't make me feel healthy and strong inside. The beauty benefits of robust health, elegant posture, and good vibes are severely underrated. When I feel so confident that I don't care about my cellulite, I don't think anyone else does either. I let my cellulite remind me of my gratitude that I am not hungry or malnourished. I let my little tummy pooch remind me that my uterus gave life to my favorite human ever, the one frolicking in the ruffle suit with weeds in her hair and mud on her legs. Beach buddies: I can't think of a single time I have ever gone to a beach or swimming pool without family members or friends. And I do not give a flipper what anyone looks like in their bathing suit, because as I mentioned above, I don't go to 'gram or snap, and even if I did, they have a magic filter to transform any image into one identical to the image posted by your favorite virtual celebrity. Boring. Anyway, the buddy system provides some protection from drowning, missing sunblock patches on your back, and the annoying glares of judgy Judies. They can also hold your hand should you come upon me unexpectedly in the dark shade of a pavilion. I promise I won't drown you or tickle you to death, rusalki-style. Have a safe and happy rusal'naia!